Cute ornament. 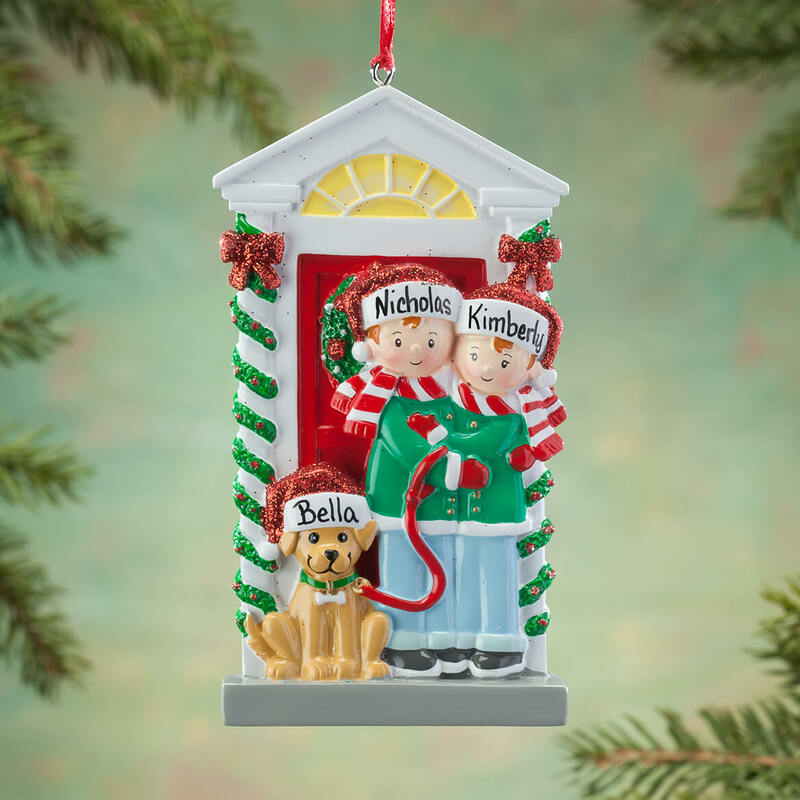 I have ordered several personalized ornaments from Miles Kimball & they have all been really cute & well made. Reasonably priced, also. Perfect for family with a pet which is considered part of the family. I really like this design. Loved that it included a pet. The only thing missing, which I will have to add myself is the date. 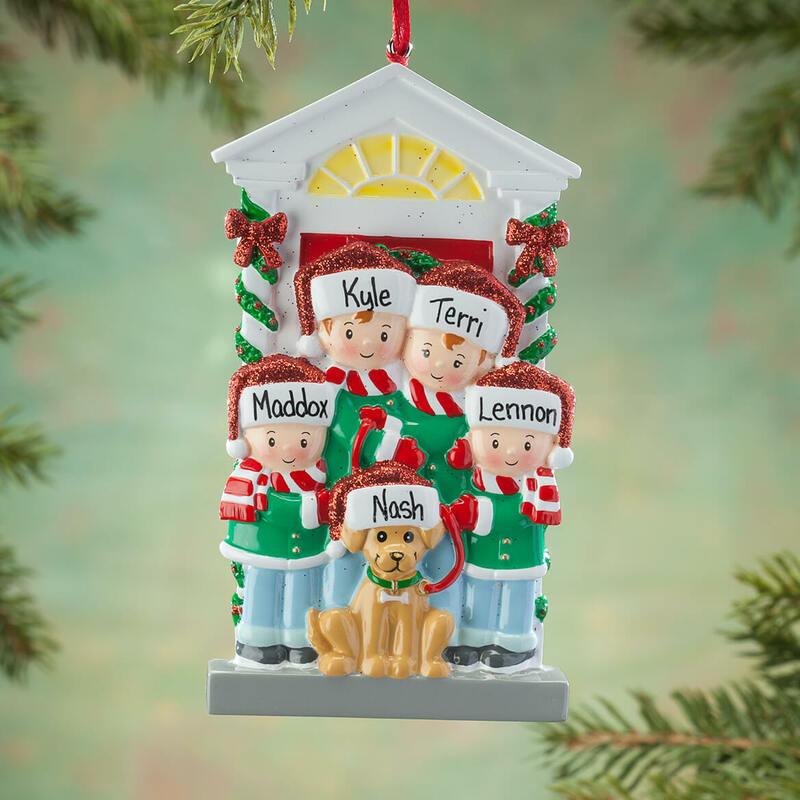 I order a new ornament every year for Christmas and I like each of them to have the: YEAR, INDIVIDUAL NAMES, and FAMILY NAME. This is very nice quality product and beautiful design. Would definitely recommend and will be ordering again. Bought this for a gift for both of my son's families and it's adorable! Perfect for giving as part of a Christmas gift or on top of another package. This ornament is perfect to have everyone on it even Kobe! This was just what I was looking for. Since we don't have kids, just a fur child, I wanted an ornament to reflect that. The ornament is very cute, exactly as shown in picture. The personalization is clear and the quality is good. I would purchase again. Easy to order. Arrived in a timely matter and was pleasantly surprised that it came in a beautiful jewel bag. Nice touch. So happy with my experience. I order a 'family' ornament every year and to be fair I was a little slow this year. I was disappointed when the vendor I typically go to did not have this one in stock. It really fit what I wanted to represent this year. My only wish is that it had the option to put the year on it and the family name. The way I see it right above the door would be a perfect spot! The ornament is cute and did not disappoint otherwise. The material is durable and the colors are eye catching. We have a new puppy and this ornament seemed perfect to memorialize this year! New house and just Us and our sweet pup- second pup passed this year. I would have really liked the gingerbread house with the couple but the pup wasn’t an option and that was important to me. I would have also liked the option for year and last name on this. 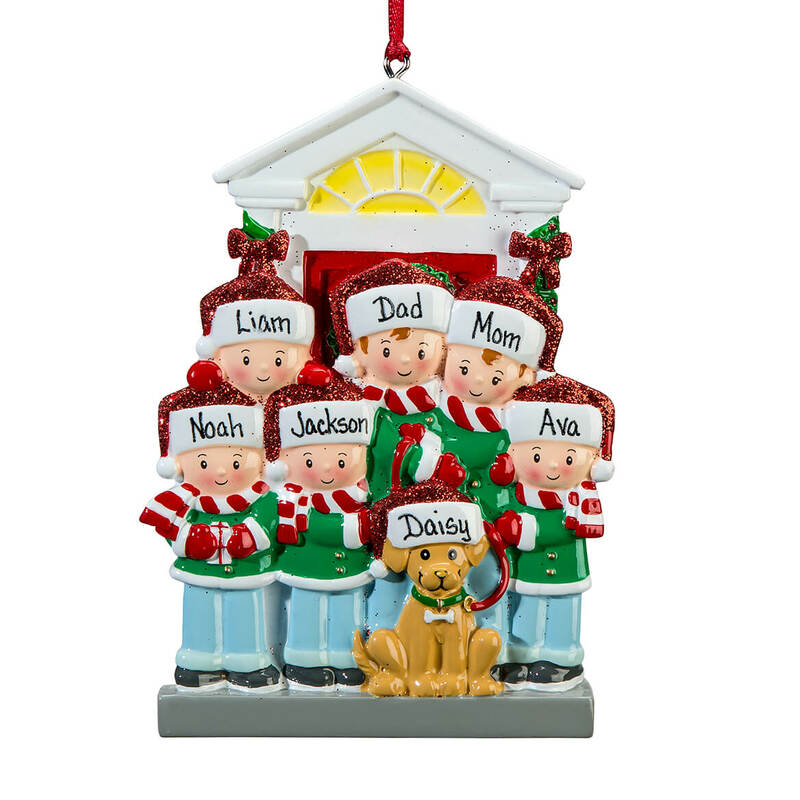 Every ornament we want to include the dogs name, but they’re always peoples faces or another animal. This one is perfect and we look forward to having it on our tree! I am positive my stepdaughter and husband will love it too! 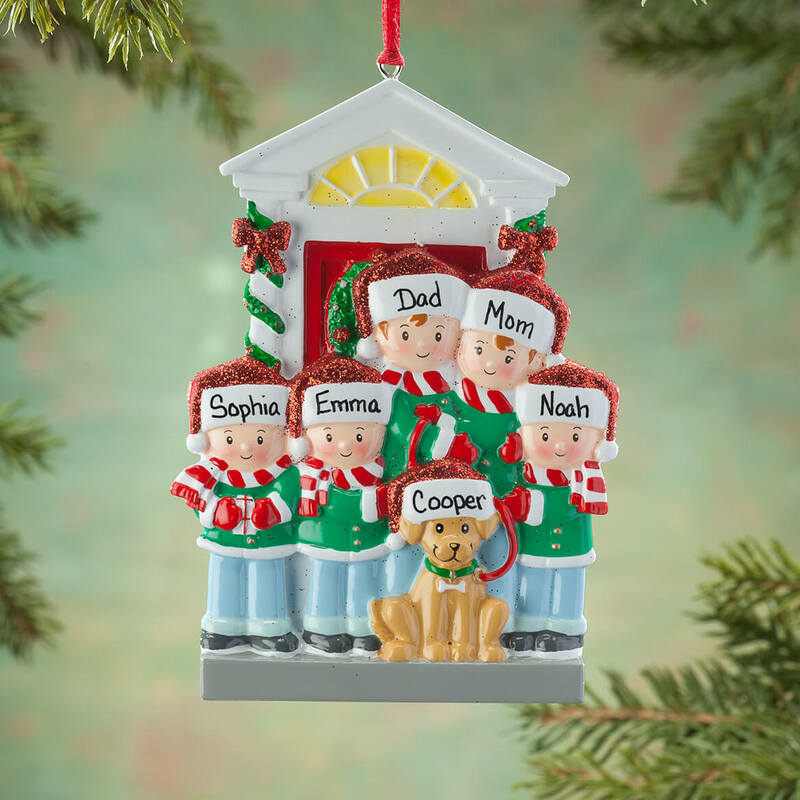 Love that the dog is included as a family member! How cute is this? Perfect to include the family dog in the ornament. Compared to other catalogs, your ornaments were more attractive to me. I love each one that I have ordered. When the names I chose came up on the screen, the finished product looked very nice. I also got 11% off and free shipping. Dog looks just like my son and daughter-in-law's dog! This is our first Christmas with our dog, so we decided to make a tradition of customizing an ornament. Super cute! Got this for my son and his family. I was able to customize the ornament to the size of the family that I am giving this to. ive gotten some of these in the past. i wanted the dog in this one to be black though. Adorable! Loved that I was able to include the family pet! 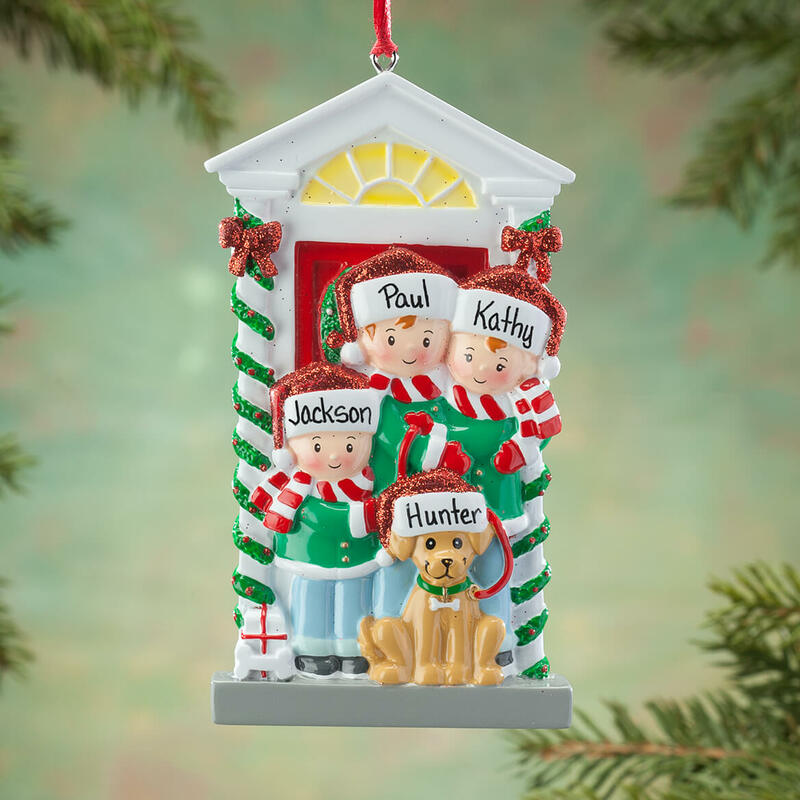 This ornament had enough space for my son and his family plus I liked the feature of adding their dog. The only downside was my granddaughter's name is Valentina and they only allow 8 letters, but I figured where I placed her name I can squeeze an a at the end with a fine marker. Always get my daughter & family an ornament. Is there an option for the color of the dog? Our son's dog is brown, but our daughter's is black. BEST ANSWER: Hi there, This ornament is really beautiful! We ordered it for our daughter & family (6 people) plus their dog who is mostly white with a little brown. I didn't even think about the color - just so happy to find one with a dog on the same ornament. Didn't notice any color choice on the dog but you may be able paint over it. I also added a small cat "button" I found at a craft store. and was able to write their cat's name on it also. Can't wait to see their faces on Christmas morning - never found an ornament with both a dog & a cat. Hope this helps you. Merry Christmas! Thank you for your question. The color of the dog can not be changed. We apologize for any inconvenience. Could I get a family of 3 and 2 dogs? BEST ANSWER: I did not see a way on the website , to order a family with two dogs, but maybe you could call Customer Service and request a special order. Good luck and Merry Christmas! Thank you for your question. We do not have a design with two dogs. We apologize for any inconvenience. Need a snowman family of seven? BEST ANSWER: Thank you for your question. 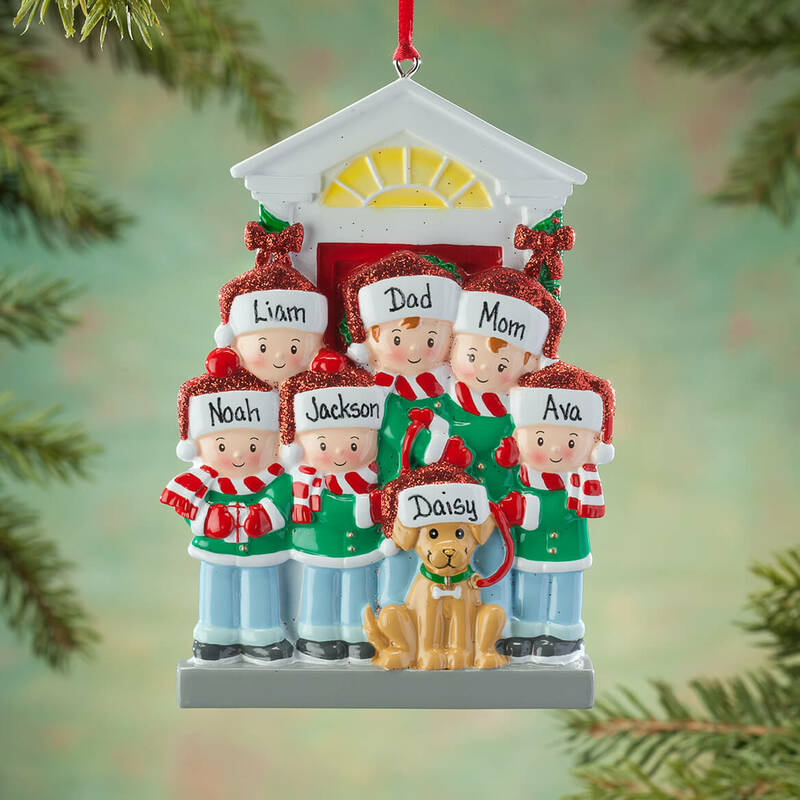 Unfortunately this ornament will not fit seven names on it. We hope this information will be of help to you. Can this ornament be dated? BEST ANSWER: Thank you for your question. Unfortunately there is no place for a date on this to be personalized. We hope this information will be of help to you.